Stephen West is currently based in Amsterdam. His shawl designs and innovative colorwork have helped him become a widely recognized and respected designer around the world. Stephen's designs have been published in Knitty.com, Malabrigo Book 3 and in Jared Flood's Wool People. He also self-publishes his own series of popular knitting books. Stephen was born and raised in Tulsa, Oklahoma. He studied dance at the University of Illinois where he encountered his first local yarn store, Klose Knit in Urbana, IL. The creative atmosphere of that local shop spurred Stephen to start designing knitting patterns and he was quickly featured in Knitty's fall 2009 issue with his Colonnade Shawl. Soon after, he began publishing more patterns and launched a series of pattern books under the name Westknits. 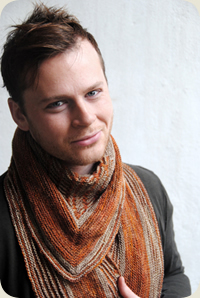 He continues to produce pattern books and hosts several online knit alongs each year like the Mystery Shawl Knit Along and Westknits Shawl Club. His simple clean designs have now been knitted by thousands of knitters all around the world. Stephen recently moved to Amsterdam to study Choreography at the School for New Dance Development. Stephen has taught workshops at yarn shops throughout the United States in Boston, Chicago, Los Angeles, Minneapolis, New York, Philadelphia, San Francisco, and Seattle among many other cities and internationally in Reykjavik, Glasgow, London and Amsterdam.